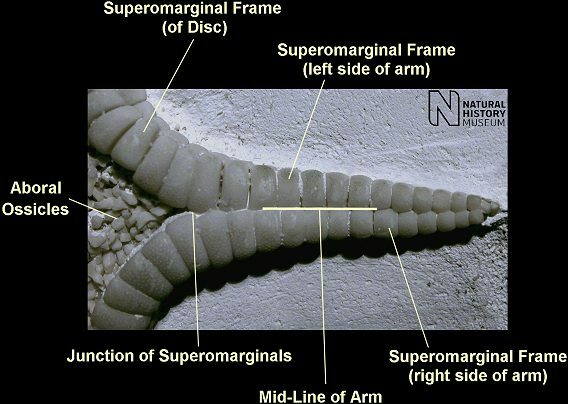 The genus Nymphaster can be distinguished from similar long-armed starfish of the Chalk by a combination of its square, blocky marginal ossicles, and the juncture of the superomarginals along the mid-line of the aboral surface of the arms. Pycinaster has more bulbous superomarginals, especially around the disc. The superomarginals of Calliderma and Recurvaster meet part way up the arm, and the aboral ossicles of the disc extend up the arm between them. 1). Aboral view of an arm displaying the characteristic features of Nymphaster (Nymphaster marginatus). Image © 2005, The Natural History Museum.